In Castel Maggiore the mountain takes to the town streets. Specialties and tastings from the Apennines starring. 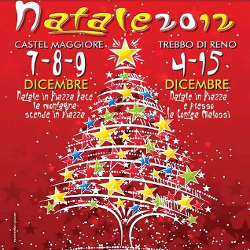 In the stalls you can find, buy and eat "gnocco" (fried dumpling), "tigella" bread filled with cheese or cold cuts, "castagnaccio" (cake with chestnut flour), chocolate, biscuit and mulled wine. On the market stalls, in addition to the Christmas theme, you can find mancano craft and hobby items.